Congress passed the STOCK Act with great fanfare, but is now ready to quietly undo the whole thing. A busy day in Washington, in which the Senate began debate on a gun control package and Republicans in the House unanimously voted down the Paycheck Fairness Act, was ending sleepily late Thursday afternoon. At 5:30 p.m., Representative Steve King was in a nearly empty House chamber, delivering a dreary stem-winder slamming the yet-to-be-announced immigration bill. Towards the end of his speech, King was interrupted so the House could receive a report from the Senate, declaring that it had just passed a bill the lower chamber needed to consider. After the House secretary read the announcement, King seemed confused. “I had to pause for a minute there, I was concerned that might be the amnesty act coming over from the United States Senate. But I’m relieved to know it might be a few more days,” he said, before resuming his reading of a 1986 op-ed from then-Attorney General Edwin Meese. No, the Senate had not somehow announced, passed through committee, and voted to approve a comprehensive immigration package without King noticing. Instead, it had passed a bill almost completely gutting the STOCK Act—one of the only recent efforts by Congress to police its own ethics and transparency problems, and one that passed with much self-congratulation a year ago. The House approved this “fix” on Friday. The STOCK Act’s essential purpose was to stop insider trading in government: to prevent members of Congress and the executive branch, and their staffers, from using exclusive information gained through their jobs to profit financially. 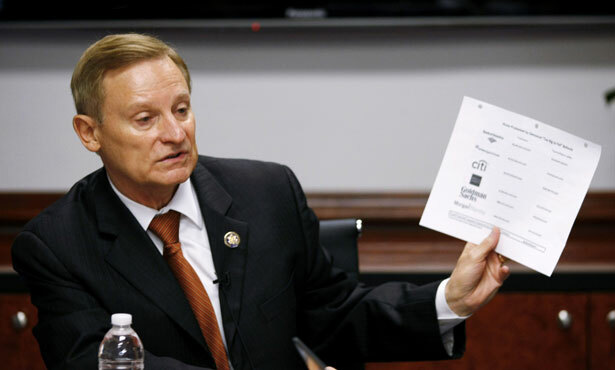 The bill was rushed into law after an explosive 60 Minutes report detailed how, among other instances of improper dealing, Representative Spencer Bachus bought stock options that would yield high returns if the stock market tanked—immediately after a confidential briefing from Treasury Department officials that Wall Street was on the brink of collapse. But what remained in the bill was still good. It made it illegal it for members of the Congress and executive branch to personally profit off confidential work information, and created extensive online reporting requirements for a wide swath of important government officials: members of Congress, their staffers, Congressional candidates, the president, vice-president, and cabinet officials along with senior executive branch employees. Their already-required disclosures would have to be placed online in an easy-to-use and frequently updated database, so that watchdogs could track the disclosures against the movements of the stock market and ferret out insider trading. The bill passed the Senate 96-3 and the House 417-2, and President Obama held a public signing ceremony. Unfortunately, the disclosure requirements for senior executive branch officials created immediate problems—the 28,000 people subject to it protested because they were already subject to extensive ethics rules governing their investments, and such personal dealing was already illegal; because some of them worked in national security and didn’t want their information online; and because identity theft might be a problem. In fact, many reformers agreed: the requirements for executive branch employees were added to the bill belatedly by Senator Richard Shelby, and many people saw his amendment as punitive, because he hated the legislation and wanted to mess with the administration by imposing onerous and redundant requirements. Congress twice delayed the disclosure requirements and a federal judge even entered a temporary injunction. But instead of tailoring narrow exemptions for national security employees or even removing the senior executive branch employee requirement altogether, Congress has done something quite drastic. The revision to the STOCK Act permanently scraps the online posting requirements for senior executive branch employees and legislative branch employees. Even worse, for those who still have to comply with the STOCK Act—members of Congress, candidates, the President and Vice President, and people subject to Senate confirmation—electronic filing is now optional, and the online data no longer has to be “searchable, sortable, and downloadable.” In other words, the database is rendered almost entirely useless. Good government groups are outraged. “The database was the only useful part of the bill ever anyway,” said Melanie Sloan, executive director of Citizens for Responsibility and Ethics in Washington, who noted that the sunlight it provided was the only real enforcement aspect of the bill, since members of Congress and staffers are very difficult to prosecute because of the “Speech or Debate” clause of the Constitution. The Senate passed the “fix” to the STOCK Act on Thursday without a roll call vote, and after many members left town for the weekend. The bill was not made available to the public nor the Library of Congress before the vote. The House approved the fix by voice vote on Friday. Now it’s up to Obama to sign the legislation—or not. “I’m not sure why he should sign this,” Sloan said. “Mostly what it does is kills stuff he touted and said ‘This is going to be great.’” The White House did not return a request for comment about the president’s intentions. UPDATE, 6:15 pm: Roll Call reports that Obama will sign the rollback, citing a court filing released Friday. "Department of Justice counsel have been informed that the President will sign S. 716,” it read. Roll Call reports that the White House also "refused to answer" its inquiries about the rollback, and notes ">both chambers attempted to keep the process quiet in an apparent attempt to avoid the political vulnerability that could come from instituting less transparency in government." Washington 'Mythbusters': George Zornick debunks the top five misconceptions about the Chained-CPI formula.